Don't you think the knitwear is only for the autumn and winter? Of course, no, we don't think so. 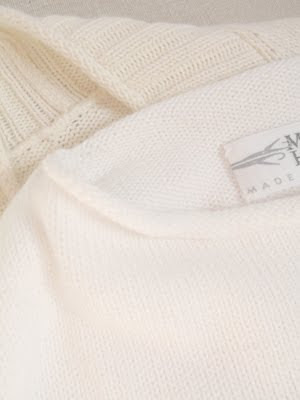 We think it possible to wear the knitwear by the materials according as the season, in spring and summer. For spring and summer collection, we propose the models by the material DAKOTA which is raw material from 100% Pima cotton, dare is knit in middle gauge and for wearing next to the skin directly too. Pima cotton, also known as extra-long staple, Sea Island or Egyptian cotton, is a species of cotton plant and make a extra fine and soft yarn from them. We produce the spring & summer collection by the material DAKOTA which is raw material from 100% Peruvian Pima cotton, is still cultivated and picked by hand today, according to traditional methods in Peruvian uplands. Also in the harsh natural conditions, Peruvian Pima cotton, soft and bulky as clouds, brings something warmth and strength of life. And they are picked by hand. It means that is the highest quality of raw material because they are picked by hand and simultaneously selected by eye, that is not to be able to do by the mechanized picking. We make the models in middle gauge by using DAKOTA. Middle gauge knitting can have a uneven texture, so it brings good a refreshing feel by moderate touch to the skin. And the small opening between the stitches brings a touch to breathe well over looks. About washing, you can use by washing machine. But it's not good to strong turn and strong twist for the knit wear. We really advise you to wash with wool program and using a washing bag, please. After washing, you can wear directly enough or you can iron at middle tempereture and steam to get soft feel. Knitwear creates one's presence according to be made a shape directly from the yarn, even though has the same structure of T-shirt or Cut & sew. Also it brings the softness of face and comfortableness that the woven fabric doesn't exist. Please try our products and discover a new thinking if you don't try it yet!